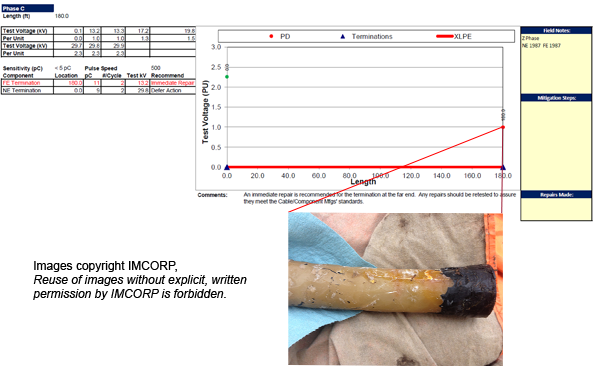 An IMCORP Field Engineer was performing a Factory Grade® asessement for a utility client. The assessment results showed partial discharge (PD) at operating voltage in the far end open air termination. Upon investigation of the far end termination, multiple stress enhancements and voids were found. As you can see from the photo, there is severe damage to this termination. There are deep gouges in the insulation, contamination on the cable insulation surface and a jagged semicon cut-back. Over time, the erosion process associated with PD would have caused the insulating material to further deteriorate, eventually forming an electrical tree and causing the cable to fail in service.